Cucusoft DVD to iPod Converter is the easiest-to-use and fastest DVD to iPod converter software for Apple iPod Movie and iPod Video. It can convert almost all kinds of DVD to iPod Movie / iPod Video format. It is also a powerful DVD to iPod converter due to the conversion speed is faster than real-time. 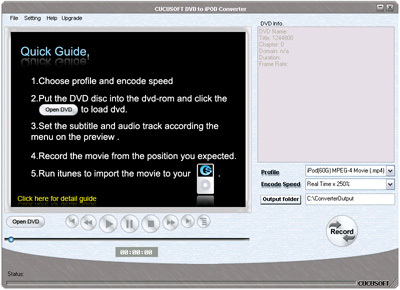 And the output iPos movie/video supports iPod screen, you can enjoy your favorite DVD on your iPod as a portable DVD Player.